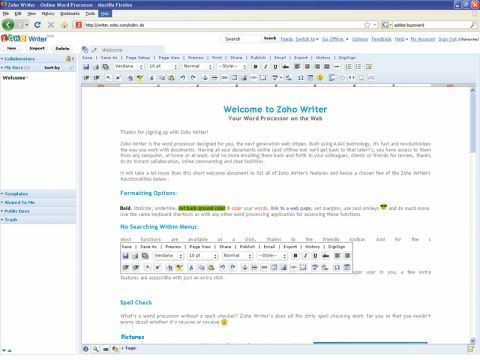 Zoho is the office suite that you'd expect to see if Google got out of the search and advertising business and just focused on applications. Its free collection spans everything from online chatting to project management and invoicing, and there are some interesting high-end features such as only allowing access from certain IP ranges. The tools often feel a bit rough and ready, but they're fairly powerful. The word processor module offers a solid range of tools for creating documents, while the Notebook offers an interesting OneNote-style method for keeping track of everything. There's not much in the way of design consistency between the different applications, though, and the number of them on offer does smack of the 'kitchen sink' approach to features. A cynic might cough and point suspiciously at one of the company's biggest features, the Zoho Web Application Creator, which has a business licensing plan and everything. Luckily, we are not cynics. Honest.